I believe that reading books to our children is one of the best things we can do. It helps encourage life-long learning and logical thinking. Reading to our children helps strengthen areas such as imaginative thinking, behavioral patterns, verbal communication, and self-help concepts from a very young age. Inspirational Nursery Rhymes understands this, and has written the world’s first self-help board books specifically targeted towards toddlers. Max shows how he uses his imagination to create his happy world and teaches his readers how they can do anything when they put their mind to it. The concept behind Inspirational Nursery Rhymes is to teach children the importance of positive self-help virtues. Some of which are personal responsibility, proper manners, and other key characteristics that can promote a happy and healthy life. There are currently four board books in this series. 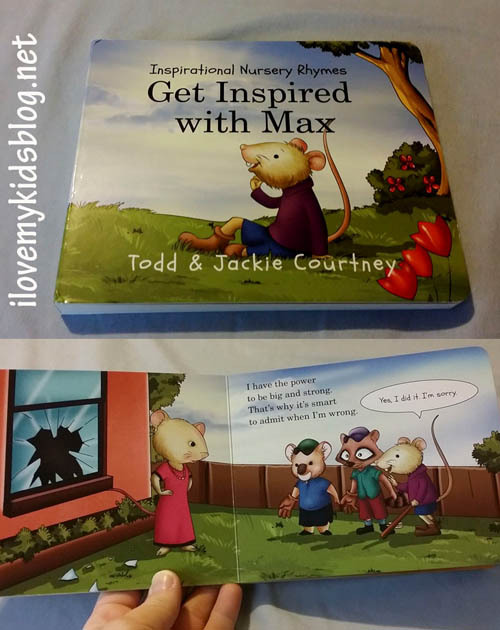 Each book follows Max, a young kind mouse, through different learning opportunities he experiences. 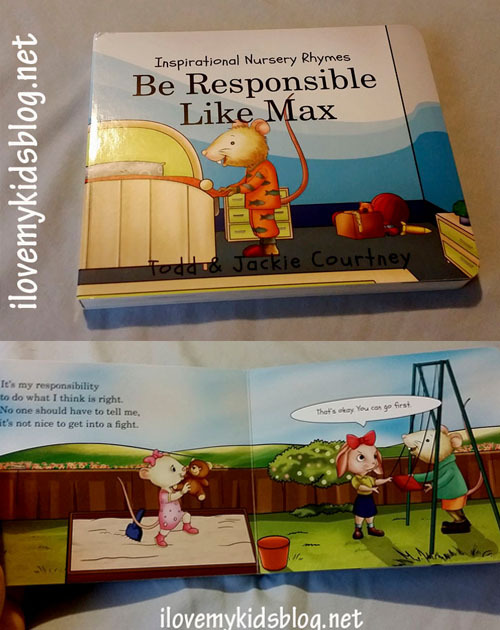 From showing gratitude for the things he has in his life, to taking responsibility when he has done something wrong, the lessons Max teaches are completely relatable to children young and old. They provide positive examples and encourage good choice making. Max teaches the “power of gratitude” by showing the reader how he is thankful for everything in his life. *This is the secular version of Max Gives Thanks to God. Interior of those two books are the same. I especially like these books because a lot of the situations Max encounters parallel those my children deal with daily. I work hard to instill positive thinking and behavior with my children, but at times, they don’t quiet grasp what is being taught. Thanks to Inspirational Nursery Rhymes and the adventures of Max, my children now have another avenue of creative learning that fortify the concepts we are teaching at home. They can relate to Max and follow his example as they get older and begin to be more accountable. Max is showing his readers, through his daily examples, how he takes responsibility for himself and how he helps out around the house. Max teaches the “power of gratitude” by showing the reader how he is thankful for everything in his life. 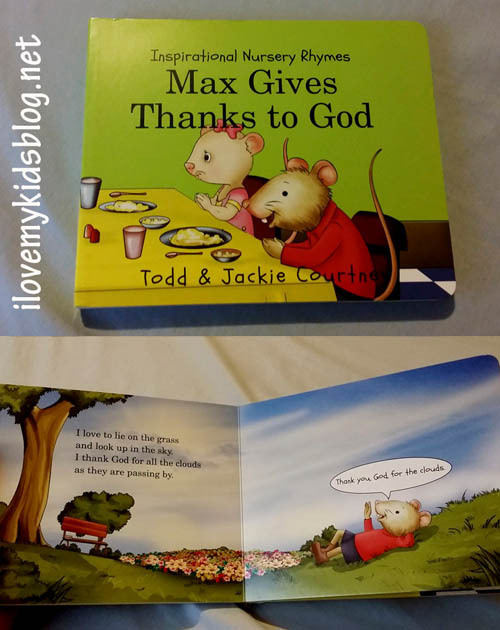 *Book is identical to Giving Thanks with Max, but in this version Max is thanking God. Reading to your children from a very young age helps create a stronger bond between parent and child, as well as a unique love for learning. 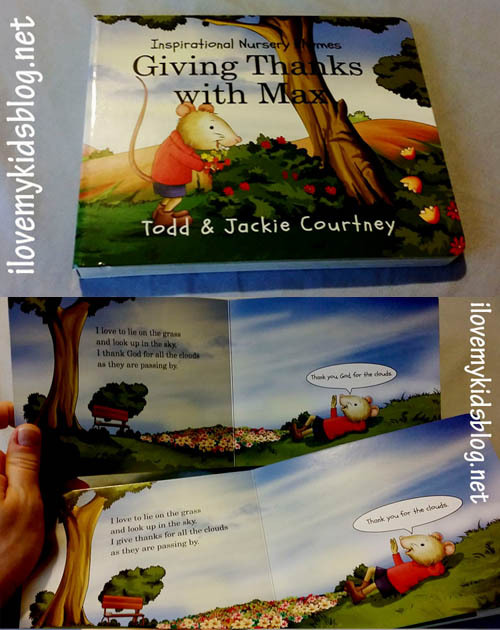 Finding books that instill proper manners and self-help concepts for toddlers is extremely challenging. However, now thanks to Inspirational Nursery Rhymes, your book library can be complete and key concepts to a successful life can be taught. Click HERE to find out where to purchase these self-help board books for yourself or a friend. Inspirational Nursery Rhymes provided me with these items for review. Regardless of our agreement, the words above are my true and honest opinion. Enjoy! « Two Players, One ball, & Magnetic Force…Will You be Victorious or Taste Defeat in the Game of Klask?